We are packing up the boxes and paper today (...and discussing the role/necessity/tradition of brussel sprouts at Christmas dinner...). What a wonderful feast and festival we've had over these past few days! I was most excited to give my sister-in-law a painting I finished, just in time. 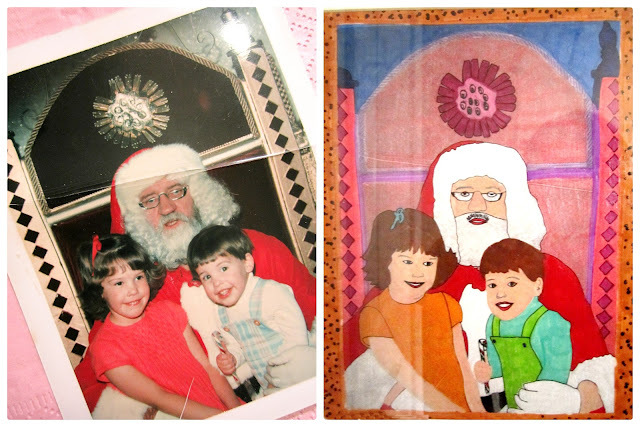 Mr. Hausfrau has had this little picture of him and his sister sitting on Santa's lap circa early 80's forever...it was just recently that I thought it might be fun to paint! Hope everyone is having a lovely last few days of 2012! Awesome painting! Homemade gifts are the most exciting and so treasured! I hope you had a lovely Christmas! All the best to you and yours in the new year. gorgeous - do you take commissions? Oh thank you! I'm very honoured to know you like my style, knowing you are an artist yourself. Yes, I work on commissions all the time! If you have a piece in mind, please send me an email: thorpebernardis@gmail.com and you can let me know your vision. What a precious gift! Your painting looks beautiful Melissa! Beautiful Melissa! Love this piece, and such a thoughtful sentiment for a gift to your sister-in-law. I bet she was really touched. Lovely job. Happy New Year! xo.